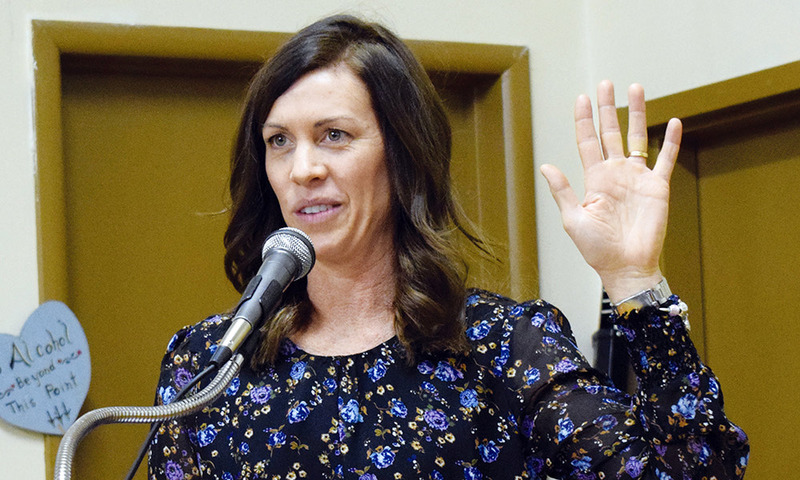 Sandi Brock, a sheep farmer from the Staffa area, spoke to the Huron County Beef Producers at their annual meeting on Jan. 9 at the Brussels Legion about connecting with people through social media. Brock, who has branded her YouTube channel and social media outreach as “Sheepishly Me: Adventures in Sheep Farming”, is the co-owner, alongside her husband Mark, of Shepherd Creek Farms, consisting of over 1,500 acres of corn, soybeans and winter wheat plus hundreds of breeding ewes and a handful of Hereford cattle. Brock grew up on a dairy farm near Paris and she was the student who was often late to school due to calving or who had to leave early to milk the herd. She attended the University of Guelph where she fell in love with agronomy. However, when she married Mark, they took the succession road into his family’s chicken operation. However, the couple always wanted to own their own farm and would eventually make the decision to break away from chickens, meaning they would be losing supply management and a lot of stability. With no formal background in sheep farming and growing up in the generation she did, Brock said she learned everything she knows about sheep farming by searching it on the internet. Through that experience, she said, she found that information was seriously lacking on the internet when it came to farming – specifically sheep farming. Information that was available on the internet, she said, was often wrong. It was through this discovery that Brock found Dr. Cody Creelman, a beef cattle veterinarian who began filming his daily exploits and posting them on YouTube. Brock said that with a large online following Creelman has done much to explain the world of agriculture to those unfamiliar with it, bringing it to a wider audience of people who are becoming more and more distanced from how their food is grown and produced. Brock then began producing YouTube clips and posting on various social media platforms. She says that she has steadily grown her online community in the years that have followed while at the same time improving her product. She said that the key to generating an online following is to have consistent and constant content coming out. There is competition, she said, so agricultural content creators need to work on content and building an audience to ensure the content works its way up the Google optimization chart. In her online content, Brock says she is constantly striving for authenticity, so she is sure to post videos on not only the good days, but on the bad days as well. Doing so, she said, is crucial to getting the message out. What Brock is doing on her YouTube channel, she said, in many ways comes naturally to her. She describes herself as an “over-sharer”, so it only makes sense that she would share so much of herself through social media, which is a dominant force in today’s world in terms of communication. Huron County Beef Producers President Elliott Miller thanked Brock for speaking to the group and said that the organization had made a donation to the Do More Agriculture Foundation, a foundation championing the mental wellbeing of Canadian farmers, in her name.